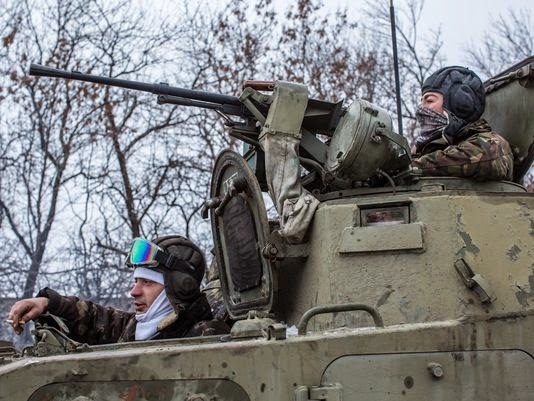 NIKISHINE, Ukraine -- Pro-Russian rebels bombarded government troops encircled in east Ukraine on Tuesday and a plan for both sides to pull back their heavy guns stalled, pushing a fragile peace deal closer to collapse. Ukrainian soldiers prepare to drive in the direction of the embattled town of Debaltseve on Feb. 16, 2015, in Artemivsk, Ukraine. A cease-fire that went into effect two days ago has been generally respected aside from Debaltseve, where pro-Russian rebels claim to have surrounded thousands of Ukrainian fighters and the battle continues. A Reuters witness near the front line said artillery rounds rocked the town of Debaltseve every five seconds and black smoke rose skywards, despite a truce that has eased fighting in many areas since the European-brokered deal took effect on Sunday. The rebels said they had captured parts of Debaltseve, which sits on a strategic railway junction, and that some Ukrainian soldiers had surrendered, but Kiev denied this. "At the moment there is fierce fighting on the outskirts of the town. There are clashes around the station. But our forces are holding their positions and they are completely within their rights to open fire in response," Ukrainian military spokesman Colonel Andriy Lysenko said. Hopes that the deal reached last Thursday would end a conflict that has killed more than 5,400 people were always low after a rebel advance in January scuppered an earlier truce. But the ferocity of the fighting at Debaltseve was unexpected and has heightened concerns in Kiev and the West that the separatists and Russian President Vladimir Putin want to cement the latest rebel gains before peace takes hold. Military trucks and tanks came and went in the largely destroyed village of Nikishine as the rebels pounded nearby Debaltseve with Grad rockets, heavy artillery and mortar bombs. Palls of smoke hung over Debaltseve, which has a peacetime population of about 25,000 and has been under fire for weeks. Monitors from the OSCE security group were expected to try to reach the besieged town after Germany said it had agreed steps with the leaders of Russia and Ukraine to ensure they had "free access" in the east. But a new call by Berlin for peace and for the withdrawal of heavy weapons to start as scheduled on Tuesday under the peace deal, reached at all-night talks in the Belarussian capital Minsk on Thursday, fell largely on deaf ears. "We do not have the right (to stop fighting for Debaltseve). It's even a moral thing. It's internal territory," said Denis Pushilin, a senior separatist representative, setting the goal of "destroying the enemy's fighting positions". The leader of one of the two rebel-held regions in the east, Luhansk, said separatist fighters had started withdrawing heavy weapons. But there was no sign of this in areas held by separatists in the self-proclaimed Donetsk People's Republic. "We will not do anything unilaterally. That would make our soldiers targets," Pushilin said in the city of Donetsk. Ukraine's military reiterated in Kiev that its forces could not pull back their big guns until there was a total truce. "In the last 24 hours there has been firing so there is no ceasefire and so there is no precondition for a pull-back of heavy weapons," Lysenko said. The European Union kept pressure on Russia and the rebels by announcing a new list of separatists and Russians targeted with sanctions on Monday. Moscow promised an "adequate" response. The United States said it was "gravely concerned" by the fighting at Debaltseve and that it was monitoring reports of a new column of Russian military equipment heading to the region. "We call on Russia and the separatists it backs to halt all attacks immediately," U.S. State Department spokeswoman Jen Psaki said. Russia, as always, denies sending arms or troops to back the rebels in mainly Russian-speaking areas of east Ukraine despite what Kiev and the West say is clear proof. The separatists said soon after the ceasefire came into effect they had no intention of observing it at Debaltseve, where they have been advancing since January. Fighting began in east Ukraine after the overthrow of a Moscow-backed president in Kiev a year ago and Russia's annexation of the Crimea peninsula a month later. Several hundred thousand refugees have fled the conflict, which has devastated Ukraine's already struggling economy, and relations between Russia and the West are at their worst since the Cold War. The West fears Putin, who has called parts of Ukraine "New Russia", wants the conflict to fester for years so that Kiev cannot control east Ukraine and is prevented from joining NATO, while Russia can retain influence in the industrial east. Moscow accuses the West of waging a proxy war in Ukraine to seek "regime change" in Moscow and "contain" Russia. Western countries reserve the option of expanding economic sanctions on Moscow over the crisis, hoping growing financial problems in Russia will force Putin to use his influence with the rebels to stop the fighting. Washington has also held out the threat of giving Kiev lethal weapons if peace moves fail.